Set your start and end fields to time format (Format -> Number -> Time) and your time difference calculation field to duration format (Format -> Number -> Duration). Once you have done that you can just add and subtract times like normal number to get the time difference. However, you will get a negative time if one event stretches past midnight. So, apply if condition and add 24 hours whenever the event stretches midnight. or you can manually prevent this condition like here. To calculate the number of seconds, you can use the Hour(), Minute() and Second() functions on that field. Here is the link to illustration sheet. 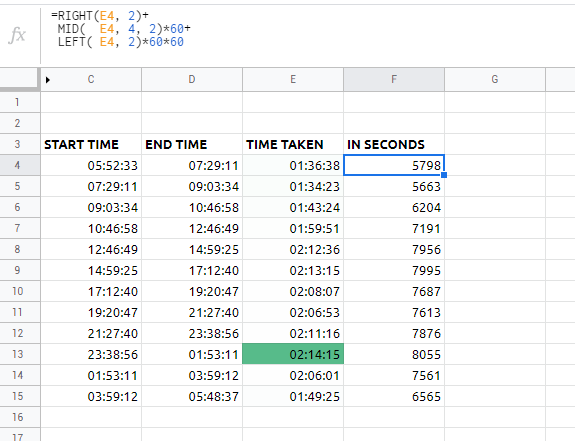 time and dates in spreadsheets are floating point numbers. D4-C4 is subtracting the start time from the end time. The if statement is cheeking if the subtraction is negative, that means you have to add a day because the time frame crossed over midnight. Taking the absolute value doesn't work. 86400 is the number of seconds in a day. Not the answer you're looking for? Browse other questions tagged google-sheets formulas google-sheets-dates google-sheets-cell-format or ask your own question.